R.E.M. and MTV are like old friends. They grew up together and, even though they’ve gone their separate ways (For the most part, MTV ditched music videos for Teen Mom years ago), they’ll always remember the old days. Last year, Rhino released a massive REMTV box set featuring tons of performances and video clips from the iconic band found in the archives of MTV, VH1, Comedy Central, and more. This year, they’re releasing the R.E.M. By MTV documentary as a standalone item and, in anticipation of this, The A.V. Club is giving away an R.E.M. 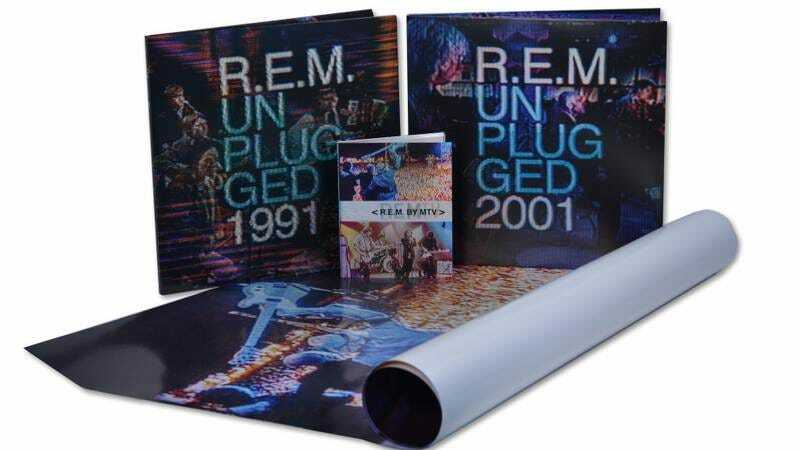 By MTV prize package to one lucky winner, including the new R.E.M. By MTV documentary on DVD, both the 1991 and 2001 R.E.M. MTV Unplugged recordings on vinyl, and the R.E.M. By MTV poster. For your chance to win, simply send an email to avcontests@theonion.com with the subject line “Unplugged.” Be sure to include your name and mailing address in the body of the email (U.S. entrants only). On June 5, we’ll select one winner at random from eligible entries and notify them via email. Estimated retail value of the prize package is $74.99. You can watch the official trailer for R.E.M. By MTV and R.E.M.’s stripped down performance of “The One I Love” from the 2001 Unplugged session below.